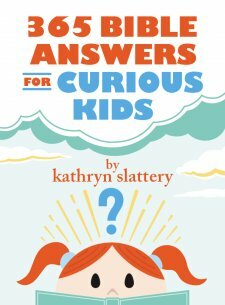 In 365 Bible Answers for Curious Kids (Slatter, Tommy Nelson, 2017), author Kathryn Slattery presents a question for each day’s devotion. Formatted as a traditional devotion, it opens with a relevant Bible verse, gives the answer to today’s question in a few short paragraphs then a two-line prayer. Related subjects are linked by a “want to know more” section that points the reader to devotions on other days. Following this path, you can experience a great portion of the book. While no subject can be deeply explored in a one page devotion, these little articles seem ideal for prompting children to think and ask more questions as well as giving them working answers on some very practical issues. Her subjects span a broad spectrum including writing in your Bible, memorizing verses, the commandments, the existence of the ark or the covenant and baptism. Some of the book’s subjects are not strictly from the Bible such as “What is Leap Day?”, The Gideon’s bible placement ministry, Communion on the moon and the cease fire of Christmas 1914. These subjects point right back to God and how He uses men and circumstances to His glory. Scripture is mostly taken from the International Children’s Bible and there is a handy ribbon to mark your place as you work through the year. There are no pictures and the blue text is embellished only by a turquoise border on each page. Overall this is a lovely book that I am eager to share with my own children or gift to other young folks who are eager to learn about God and His Word. I can certainly recommend 365 Bible Answers for Curious Kids to you.